I was in the room where the smaller pieces are on the floor and my husband came in and said, "Is ALL THIS still blues?" (or something like that). I said, "Yes, but the pieces are getting smaller and smaller all the time. I have to go through this stuff and sort it - to kindling, crumb blocks, or to be cut into 1.5", 2" or 2.5", 3.5", 4.5", or 5.5" strips. I also need some 3.5" squares. "So," he said, "I could just gather all this up and use it for kindling?" I said, "Not yet!" But it's definitely getting there. 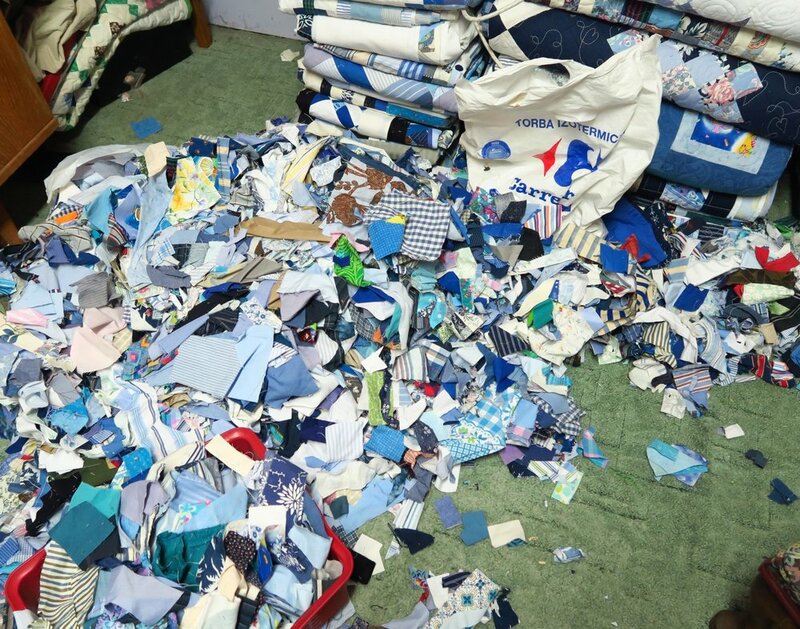 The scraps pile is STILL quilt large - but it is all loose and fluffy now. And I'm picking out pieces for three tops that I have decided to start and try to use up as much as I can with these pieces. Then what? I may just gather all the rest up for crumb blocks. Something like "A Hot Mess" - I can use all shapes and sizes for that. Did I mention the World Cup? We had to go back to Warsaw again to submit some more documents for my temporary residency card and I was reminded of this! Poland definitely has World Cup fever. Sports bars during the games will be crowded. People are selling red and white paraphernalia (Polish theme) everywhere. We were on the train for a while as we went in to the office we had to go. We saw a guy get on the train holding his Polish banner (this was 9 am - the game was 10 hours later!) I'm assuming he was going to end up with friends watching the game - Poland vs. Senegal. This little onesie says "I'm cheering together with dad"
We also had to walk past this store with these fun things in them - unfortunately they weren't open when I went past. I was prepared to go in, but I didn't want to wait 25 min for them to open up at 11 am - I think that's crazy late! As far as I could tell these were a collection of kitchen hand towels. I was going to buy a set. I'm such a sucker for these Polish folk designs! I'm sure we have to go back at least one more time to pick up my residency card when it is finished. I'll try to get back into the store and see what they have in these designs! And that's what's been happening from my part of the world! I'm changing sprinklers, running to the hospital with my friend, helping another lady with some transportation needs and taking care of paperwork - along with sewing!